"I am not at all in a humor for writing; I must write on till I am." Here is my paper anniversary present. 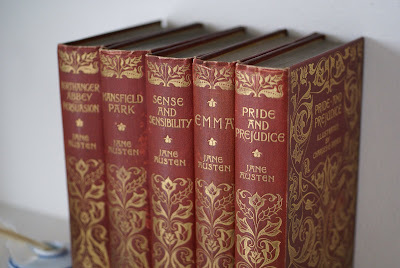 It's a set of 19th century Jane Austen novels. Pretty great, huh? They are in beautiful condition. I almost hate to touch them. (I said almost). 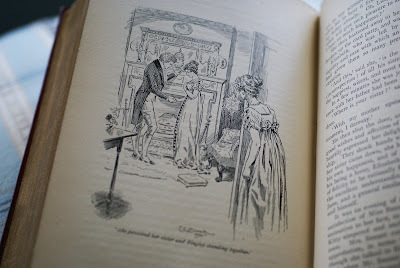 "I must confess that I think her as delightful a creature as ever appeared in print, & how I shall be able to tolerate those who do not like her at least, I do not know." My husband the deal finder found them on Ebay (of course) and they came from a book store in a castle in England. Can it get any better than that? I was blown away with this incredible present. Merci beaucoup mon mari! The second anniversary is the cotton anniversary. . . Ooh la la! How beautiful, I am jealous. Congratulations and Happy Anniversary. Kerri, happy Anniversary to your and your Husband! I too am SO green with envy! That has got to be a gift right up there multi-carat diamonds! They are just amazing! Old books are the best!